Luce bayou - Lake Houston Fishing! I am new to fishing crappie in the bayou can anyone tell me a decent spot to catch a few crappie this time of year and possibly how deep to fish. I am using a slip bobber and minnows in a 14 foot aluminum boat. Thank you to anyone that can help I really appreciate it. 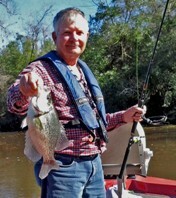 It is pretty tough to fish for crappie in the bayou this time of year but you can still catch a few. I would go to the front and look for structure in 10-12 foot of water, fish about 8-10 foot deep. In the summertime on this lake it is always 8-10 foot that you would want to fish, that is the thermocline on this body of water in the summertime. Hope this steers you in the right direction. So where would be the best place to catch crappie this time of year? Try the little bridge by the Poderosa boat launch, usually a few hanging around there. Other than that look for structure in water 8-10 ft deep. down in the main lake when wind permits you to fish it safely. For a fee, I can tell you which boats to follow to find some crappie. All kidding aside, I can help you with Bass but I am CLUELESS when it comes to the Slabs! I am out here fishing right now. All I have caught is a 10 inch and a 13 inch crappie but I wouldn't mind catching a few bass too I am new to fishing lake Houston because I usually do all of my fishing up in Alaska. I had a slow start this morning not catching a single fish. Then around 3:30 I moved to the mouth of Luce bayou ans I caught a fat 13 inch crappie and almost immediately a few more 10 inchers. After that things went dead so I moved up to the bridge by ponderosa where I couldn't get out of the 9 inchers. Besides all of the drunks speeding around me, literally around me, I think I caught more of a sunburn than anything. sounds like you had a happy day playing with the crappie and drunks . Nice going zschwartz. A little hard work will pay dividends every time on this lake! Listen to JJ, sticko, and SK. Those guys know how to tempt a crappie or two. There are still some nice crappie in Luces. The last few weekends I have been catching them off my pier at night under the lights at about 3 ft deep, with minnows of course. Saturday nite I caught 16 from 11-14". Beats sitting in the heat - biggest ones caught between 12-2:30, unfortunately ran out of minnows.